You may remember from a few weeks ago my moaning and anger regarding my Shellac experience? Today I want to share the evidence, my friends. I should start off by saying I know I am a snob, and not your average customer, but come on. I didn't pay $35 to have you paint my fingers. And when we're conversing and I tell you that although I am not a certified nail tech, I consider myself an expert-every girl, and have high standards, you should have put forth your best effort. I will say I LOVED the color combination, Shellac 'Asphalt' and 'Zillionaire,' even if 2 coats of Asphalt was needed. I will be reenacting this manicure with regular polish, I am thinking the closest dupes would be Zoya 'Dove' and Nubar '2010'. I did love the longevity of the polish as well and the strength it gave my nails. I took it off within the first week as I was unhappy with the cuticle cleanup/lines plus I wanted to paint something different. Removal, although a little time consuming was a breeze. I used the foil method, soaking a cotton ball in acetone polish, resting it on my nail, and wrapping with foil for 15-20 minutes. 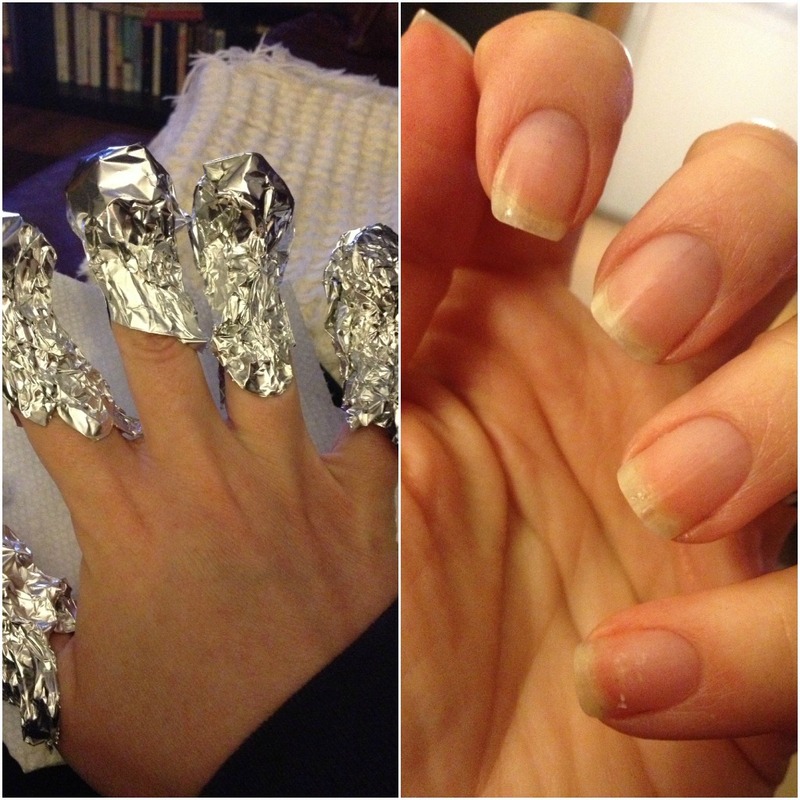 Upon removing the foil, the polish scrapes off easily with an orange stick/cuticle stick. The only damage I sustained was on my pinkie from peeling off polish at the office, my own doing. Overall, I will not be paying for gel polish applied "professionally" again. I am considering investing in an at-home system and will do them myself. I have done a lot of research in this area and had initially decided on Gelish, but with Sally Hansen and Sensationail receiving rave reviews, I will be looking in to that. I don't want to discourage you from getting gel manicures, I have heard many people say how much they love it. I would just be careful where you go. I had my reservations ahead of time, but decided to stop being such a type A personality and trust a certified nail tech. Yeah, my mistake. I learned a $35 lesson here folks, I have high standards when it comes to my nails, and will only do my own nails from now on. And hey, when I do invest in a system I will be glad to give out high quality manicures to my friends and family! I like the color though - eesh. That's disappointing! But the color combo was great. Would love to see you recreate it! I was hoping since it was reputable, it would be so nice!! I'm positive you can do a better job one million percent. I would have been upset with this mani as well. Colors are awesome but the job was not. I had a bad experience with shellac and have not gotten it again. I sat through 3 attempts to get one of a red to take, with no luck. Ended up leaving the salon with a completely different color and not one that I really wanted. And I think it lasted maybe a week before it started chipping. I didn't have to pay for the mani though, which was good considering. But I was not impressed with it at all. Not sure if the shellac they used was just old or what the deal was?!? Sorry you had such a disappointing mani! I've heard of the foil method but never tried it! I have polish on now that I'm dying to get off so I might have to do that tonight. And that suuucks that you paid $35 and she didn't even do a clean job - although I do love the polish combo!! I have never heard of foil method before. Going to try it out one day. Also Amy you do an awesome job painting you nails. I would have been mad at that ladie too. I can't believe someone gets paid to paint like that! No offense. :) I love the color. I've had done shellac three times, three different places and loved it, until I had to take it off. They did the foil trick too and then scraped and scraped and scraped. At all three of the salons! My nails were crap afterwards and took at least a month to recover. I'm so curious about the at home systems. If I can get it off easier than the technicians, I'm all for it! I would have been absolutely ropeable if I ended up with a mani like that. In fact I would have insisted on having it removed and getting my money back. The colours are awesome but the handiwork is a shocker. I've had one experience in a nail salon and got fake nails for my sisters wedding in February this year. They filed my nails down almost into the nail bed in some places. I went and paid $100 somewhere else to have the shitful things removed after a week because a)I turned out to be horribly allergic to the acrylic and b)I hated the way they felt. My nails have NEVER been the same since - they constantly peel and I can't grow them long anymore. Now I just paint my nails myself. It's easy with a bit of practice and I would rather spend money on buying more polish colours than having some idiot try to paint them for me. Agree- great colors, bad job. I hope they gave you your money back? Can't wait to see what you do with gel at home manicures! Late to the game, but holy crap! I've done better nail jobs on myself after three glasses of wine! I would have strangled the manager.